I was just thinking about how far Tim Burton has fallen the other day. After reading about all of the blood and tears (literally) he put into Edward Scissor hands, seeing him at the helm of boiler-plate blockbuster garbage that tanks critically and commercially like Alice in Wonderland 2 (which I can confirm is bad), makes me a sad panda (Miss Peregrine wasn't bad, but Burton shouldn't be a "wasn't bad" kind of guy). I'm also constantly reminded of how great Beetlejuice was, and how everything basically just came together on that movie, from the stellar cast to the dark direction of the film. Well, he's back now, but in a decidedly less dark form more akin to his playful cartoon iteration. 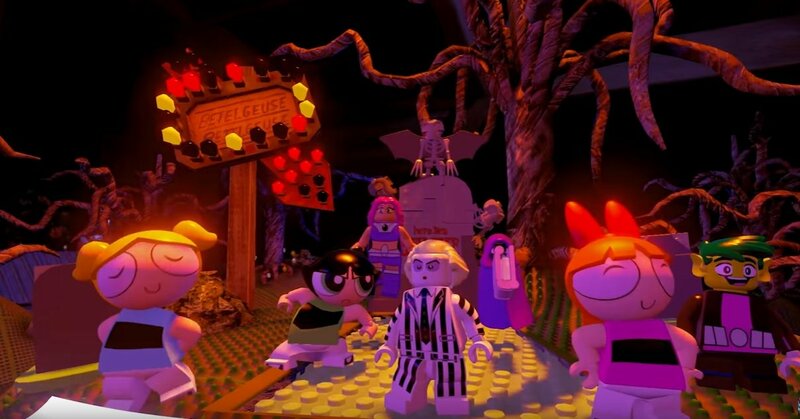 As part of its "Wave 9," (which still utilizes the core game by the way), LEGO Dimensions is launching Teen Titans, Powerpuff Girls, and Beetlejuice-themed content. While this seems like a pure cash grab, I'm actually surprised at the amount of effort the team puts into not only the game itself, but the marketing.